… I knew it would happen eventually but i’ve got myself a nasty little cold. It’s a proper cold too, the kind with a blocked and runny nose (how is this possible?) Plus a sore throat. I’m not sleeping and finding it hard to be interested in food which is also making me grumpy. As you can imagine, i’m a right laugh to be with. In one way it’s really rather horrid but in another i’m really pleased I’ve got this now and not closer to the big day itself. That would be really rather mean. I think it’s all finally come to a head now the year is wrapping up but I’m not particularly pleased. The worst thing is that I can barely taste anything and I hate that… even these stunning buns didn’t really get a look in but The Viking tells me they were rather nice. 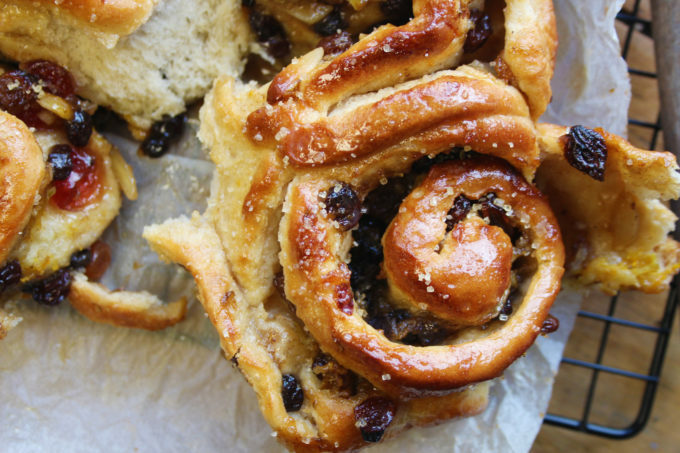 I do love a rich fruit bread at Christmas… there are so many to chose from such as the divine Italian Panettone, the German Stollen or the colourful Mexican Rosca de Reyes but I do really adore the classic Chelsea Bun. 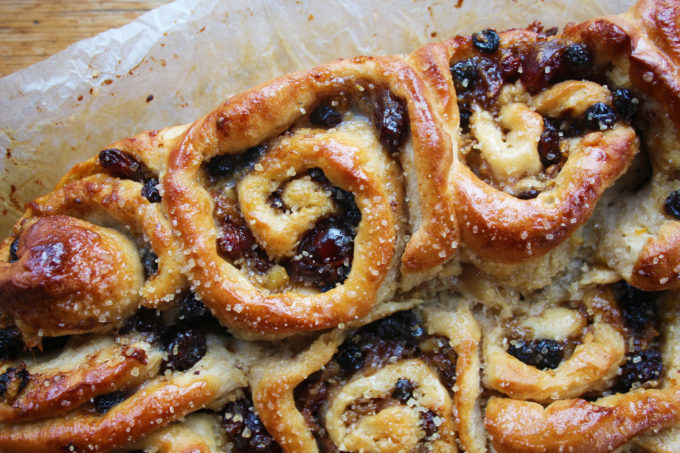 I realise it’s not particularly a Christmas thing but they look so festive with their fruit-laden swirls and don’t take much adaptation from the norm to make them seasonal. I’ve simply used a jar of my favourite mincemeat and some extra cinnamon along with the grated pear which lifts it rather nicely. The dough is an enriched bread dough with sugar and eggs so you need patience with this. It takes a day to make with very little time to spare so ensure you have plenty of time and you’re not planning too much. start with the dough… put the flour, caster sugar, salt and yeast into a large bowl and set aside. Put the milk, butter, clementine zest and mixed spice into a small saucepan and cook over a low-medium heat until all the butter has melted. Set aside until just lukewarm. make a well in the middle of the flour mixture, then pour in the milk mixture and add the egg. Mix with your hands to form a rough, soft dough. Tip out onto a lightly floured work surface and knead for about 10-15 minutes until smooth and elastic. (I did this in my stand mixer, using the dough hook on low speed for 10 minutes.) then put the dough in a lightly greased bowl and cover with cling film. Leave it to rise for about 1-1½ hours or until it has doubled in size. once it’s risen, tip out the dough onto a lightly floured work surface and use a rolling pin to roll into a 40cm x 50cm rectangle. Using a spoon or spatula, spread the 100g butter in an even layer across the entire surface of the dough, then spread the mincemeat, grated pear, clementine and sprinkle over the 100g sugar. Top with mixed dried fruits and gently press with your hand to secure in place. Roll up the dough into a cylinder along the long edge, keeping the spiral tight. Using a sharp knife, cut into 12 even slices. grease and line a baking tin roughly 20cm x 3cm and arrange the buns snugly in the base. Cover the tin with cling film, set aside and allow the buns to prove for 45-60 minutes until risen and puffy. While the buns are proving, heat the oven to 180°C Once proved, bake the buns for 25-30 minutes or until golden brown. While the buns are baking, prepare the glaze: put the milk and caster sugar in a small pan, then bring to the boil over a low heat. Remove and allow to cool. Remove the buns from the oven and immediately brush with the cooled milk glaze, then sprinkle over some demerara sugar. 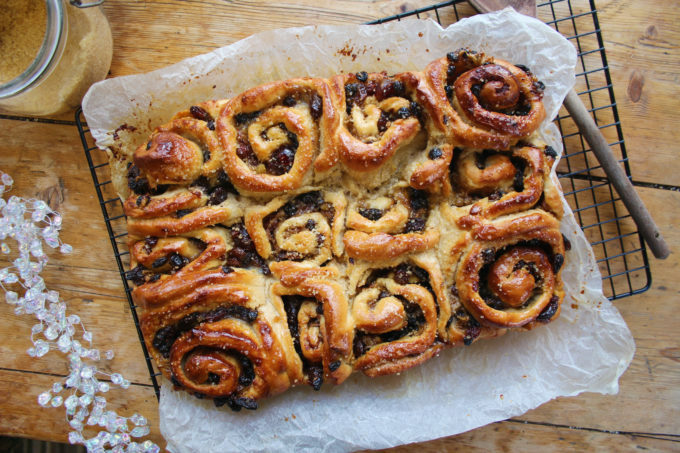 I cannot think about Chelsea Buns without remembering a residential school trip when I was 14….. That week, the whole year had made Chelsea Buns in Cookery and we ALL decided it would be good to take them on our school trip…… That was a LOT of chelsea buns! I don’t think I have fancied one since…..
On the other hand…… the mince pie twist may just perk my interest!!!!! 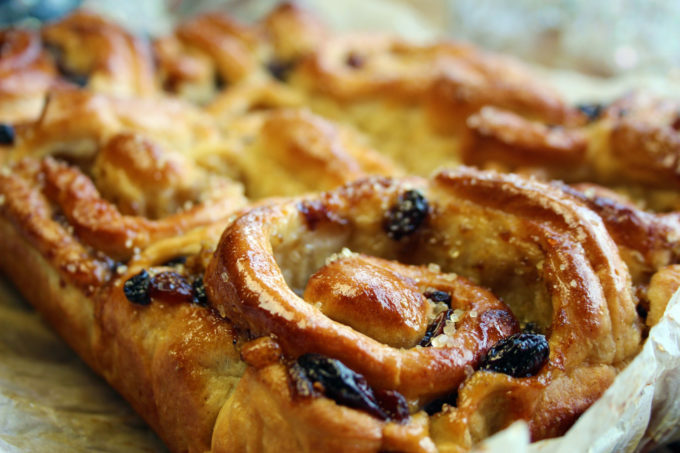 ahhh man, LOVE a chelsea bun, I could eat them all day and these ones went within an hour! Sorry not to have been visiting one of my very favourite blogs much recently. What with moving and all, things have been decidedly mad this year. Hoping they will settle down a bit more next year. Hope you get well soon. I love the glazed top and the nutty and fruity flavors. This is delicious! thank you – was so delicious! The buns looks so great! Thank you for sharing the recipe! !